Published by Joshua Clare-Flagg on 7 Aug, 2016. 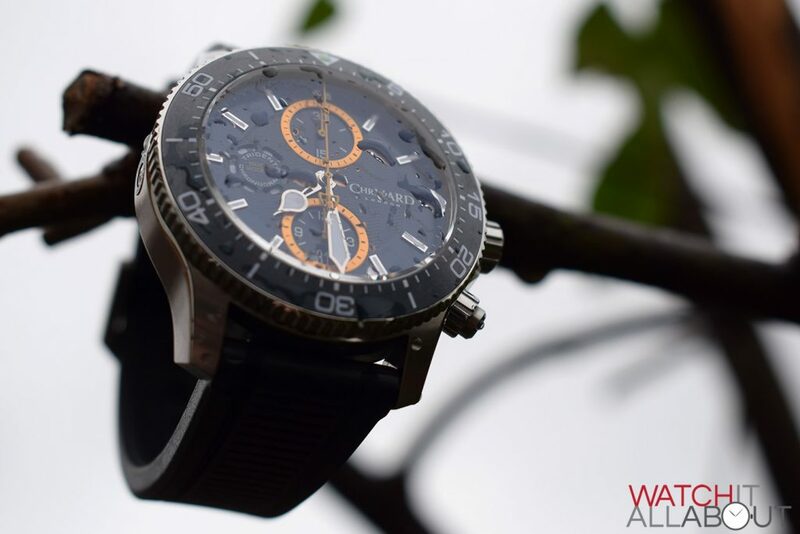 The Trident Chronograph was one of the most highly anticipated models released by Christopher Ward in recent years; and I was naturally rather interested in reviewing one. My personal preference is always going to be on a bracelet, so I was initially a little sad when it arrived on the rubber strap. 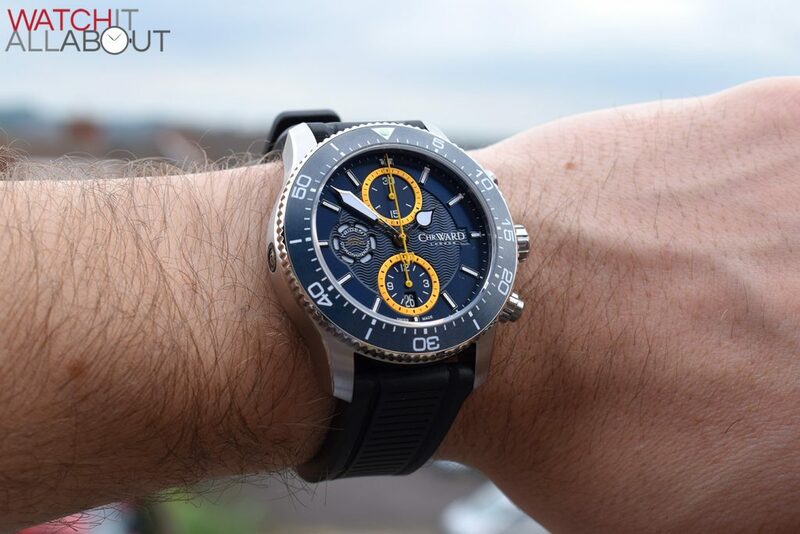 However, I promptly came to realise that it makes it look even more purposeful, and is really the best option for what it is: a high precision, impressively specced diving watch. 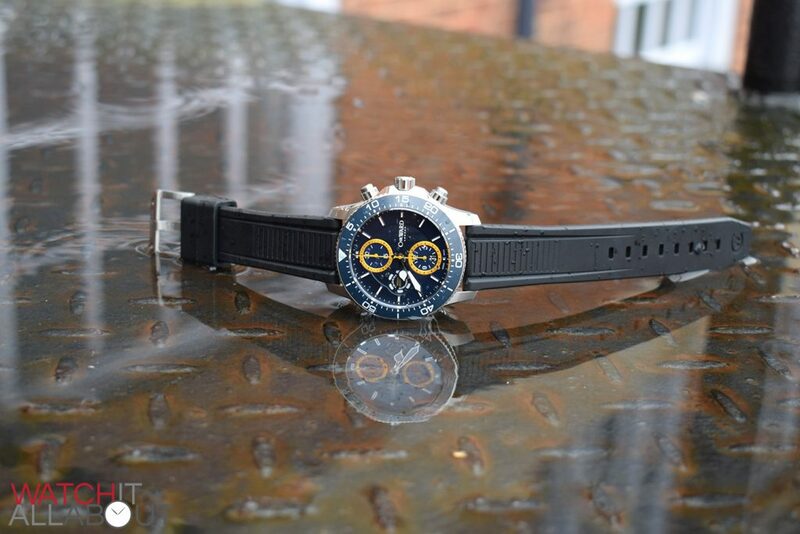 The Trident Chronograph will cost you £1395 with rubber strap, or £1445 with a bracelet. 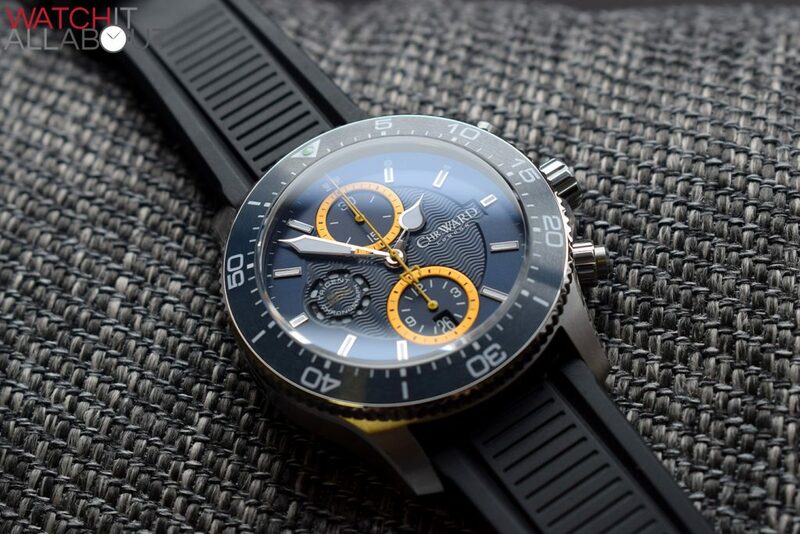 Of course it’s not cheap, but let’s face it, on initial inspection is a great price for a Swiss Made automatic chronograph with an ETA Valjoux 7750 movement. 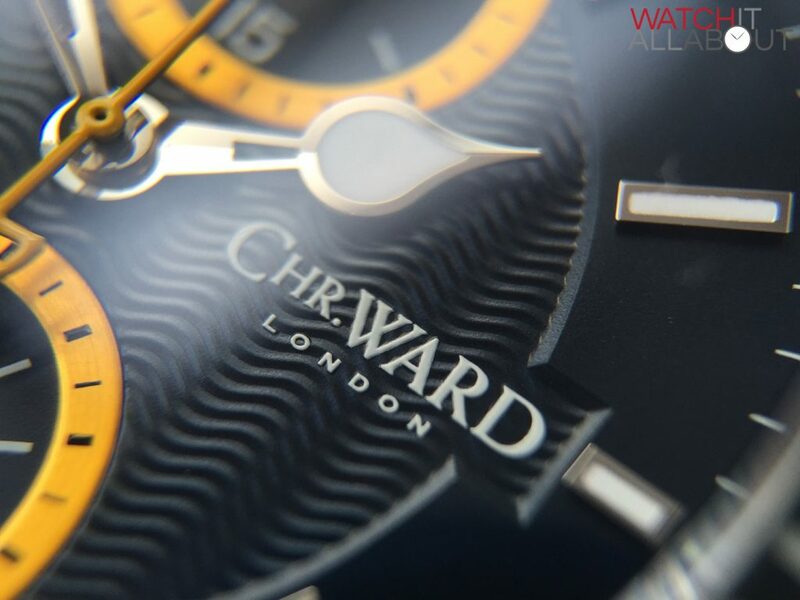 Let’s take a closer look to see if it matches the ethos of CW: excellence at value. I’ll just go straight there and say that the case is pretty large. The diameter of 43mm isn’t the culprit though (that’s perfectly reasonable for a modern diver), but rather the massive height of 17.1mm. 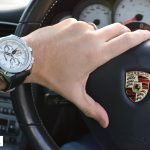 I like heavy, large watches so it doesn’t bother me at all but that could be a major factor for some of us. The weight supports the size: 131g is certainly on the heavy side – you definitely won’t forget you’ve got this on your wrist. 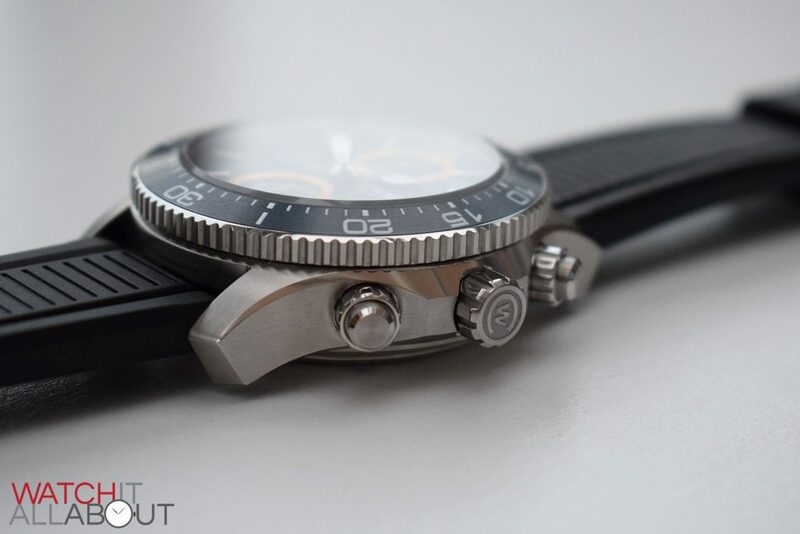 Because of these factors the Trident Chronograph has plenty of wrist presence. 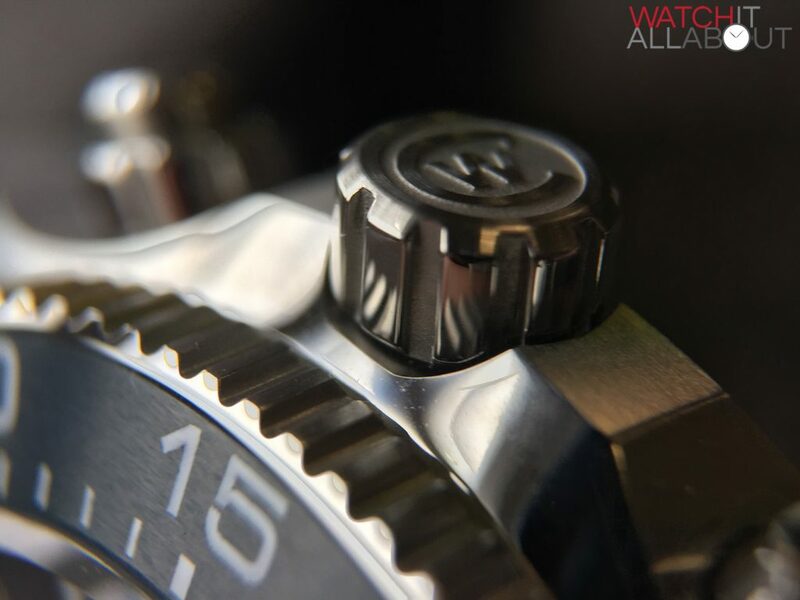 The general case finishing is a level above the usual Trident range – even more so than the lovely C60 600 family. 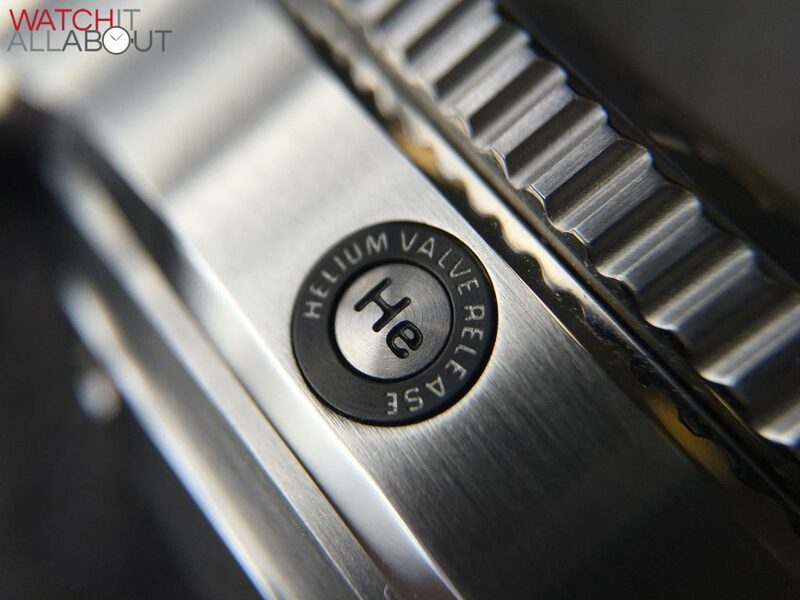 This could be because of the extra complexities of the pushers and helium release valve making it more intricate. 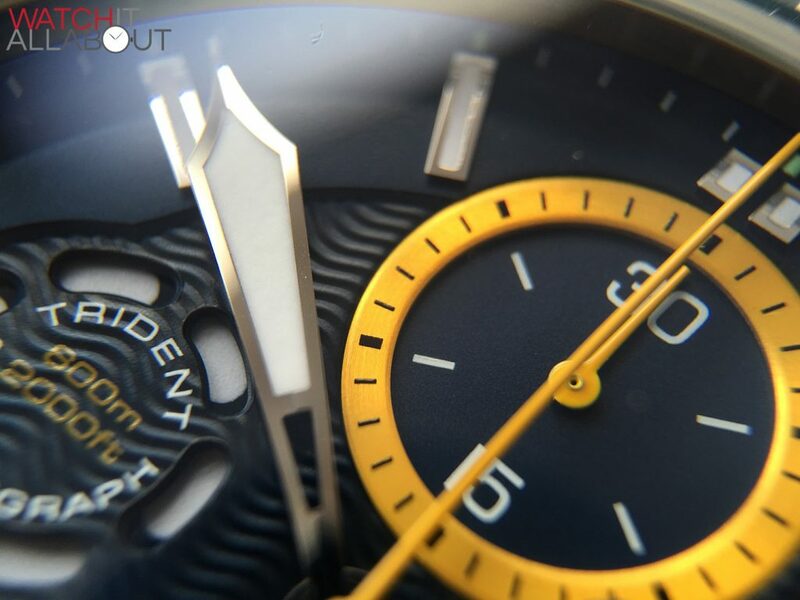 Sitting atop the case is a sapphire crystal with anti-reflective coating on the underside. 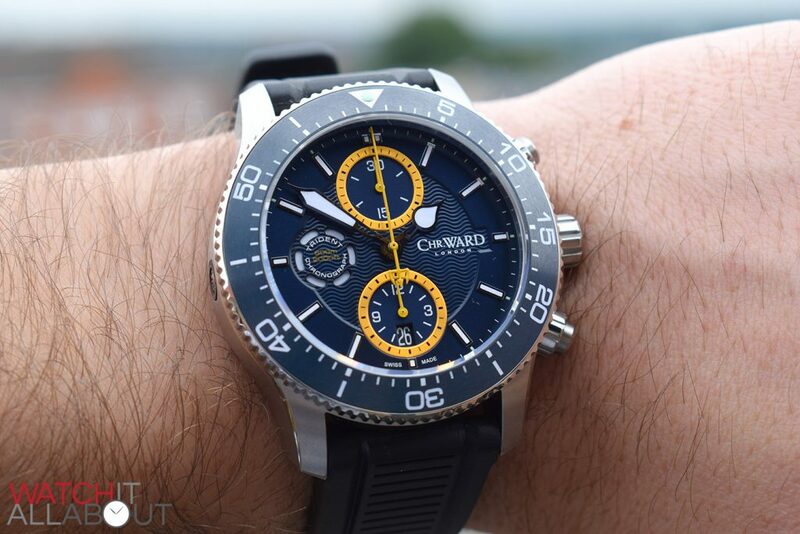 Whilst I wish sometimes CW would apply AR on the top too (which would rival the likes of Omega, Bremont and Sinn) I appreciate the longevity issue and how it can be scratched off. It’s extremely clear, and does a good job of eradicating major reflections. We’ve got a cheeky little helium escape valve located on the side of case at 9. It’s intricate and neatly designed for the size: it’s not an eye sore, it looks cool. 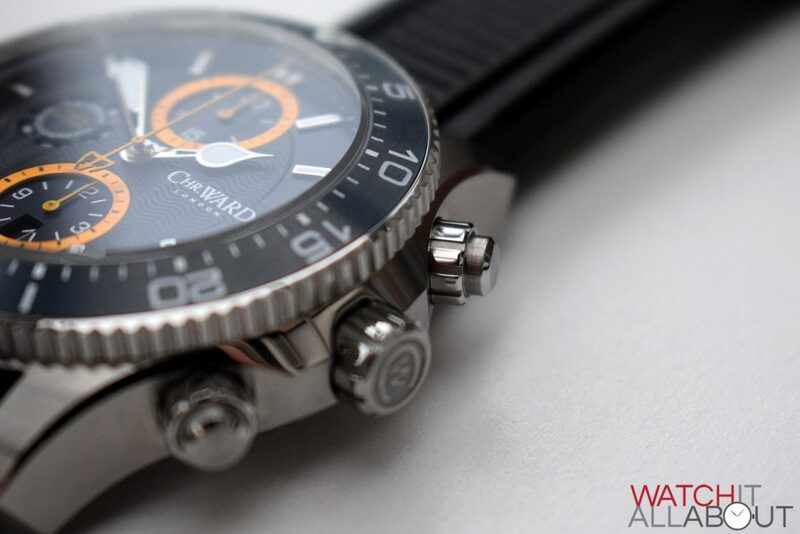 The action of the 120-click bezel is quite stiff – not as buttery as I would have liked. The grip is great though so you can get a decent purchase on it. The bezel has a ceramic insert with engraved and lume filled markers within. These dashes and numerals are all very well done, with no flaws visible to the naked eye. There’s a pip at 12, which is also well applied. The lume strength is just as good as the dial (more on that later), and the lume colour match up too. 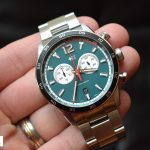 But that’s not all, the base colour of the bezel and dial are also well tied together. It’s a little lighter, but the same hue, just a different shade so they work together. The screw-in crown is very nicely done; with thick toothed grip and a mixture of finishing. 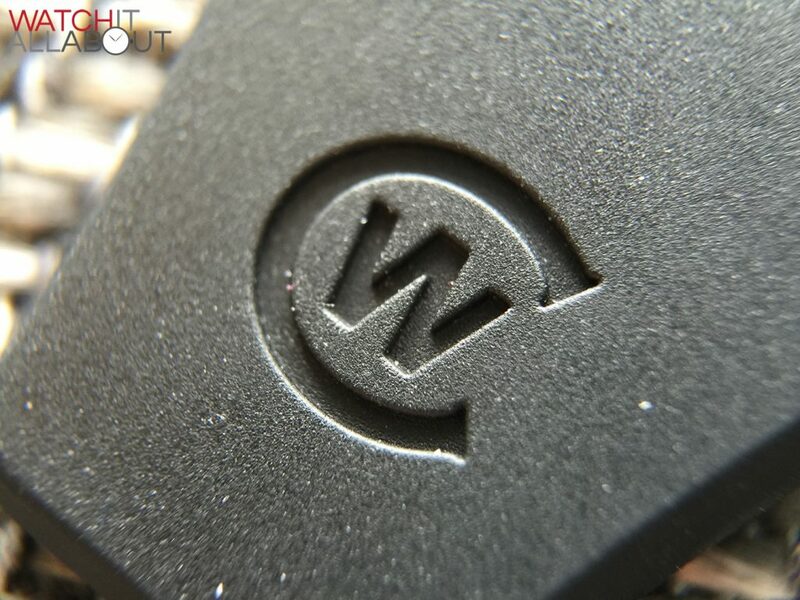 On the end is the CW motif (which will change with the new branding, likely to the flag icon) which is deeply engraved. I’m pleased to see that it almost always lines up perfectly perpendicular to the case when fully screwed in too. It’s sturdy in the hands whilst using it, but that could be due to the movement. Above and below the crown are the screw-in / locking pushers. As expected, the top one is the chronograph stop / start, and the bottom is reset. In normal circumstances, the surrounding sheath is screwed down, locking the pushers in place and sealing them. This is required for the 600m water resistance. The locking nuts are a joy to use, gliding up and down whilst you screw them in and out. You could always leave them open, and in my opinion they look very cool either way. Much like the crown, the pushers have a pleasant array of brushed against polished finishing which exemplifies the impressive appearance. 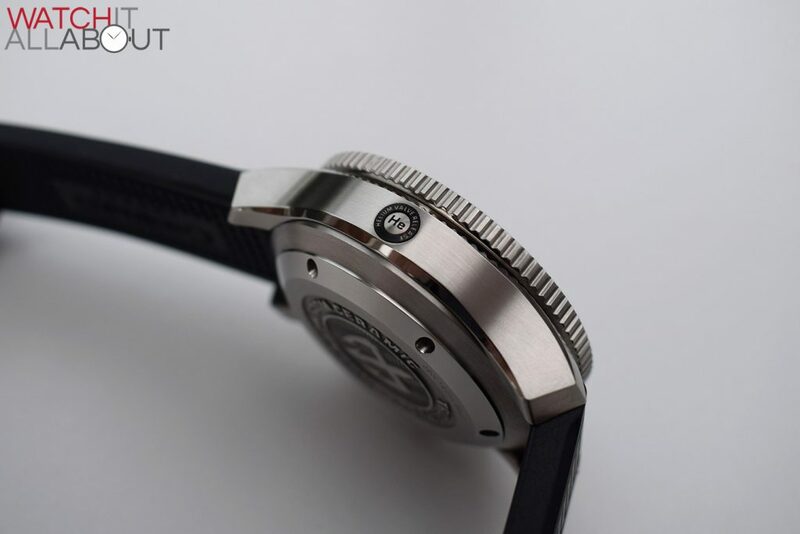 Underneath the case is a deep stamped screw-in caseback. Whilst I personally would always prefer an exhibition window to view the movement, the solid case back is better for water resistance. The detailing is impressive; due to the depth of the pattern and writing it’s obvious that it’s a thick piece of steel. Of course, at approx £1500 you’d expect a well-made watch. But I’ve been pleasantly surprised with the attention to detail and level of finish. 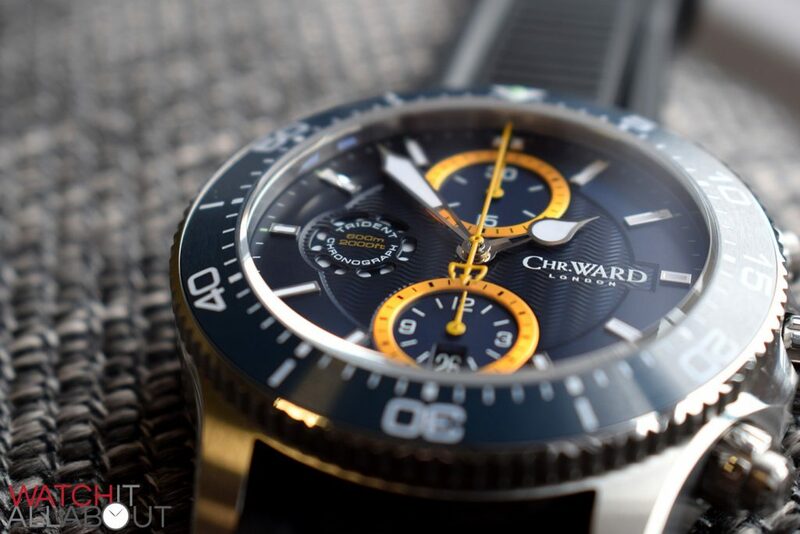 Of course, being a chronograph the dial’s primary function is to display that aspect effectively. This it does, with the subdials catching the eye due to the yellow borders. 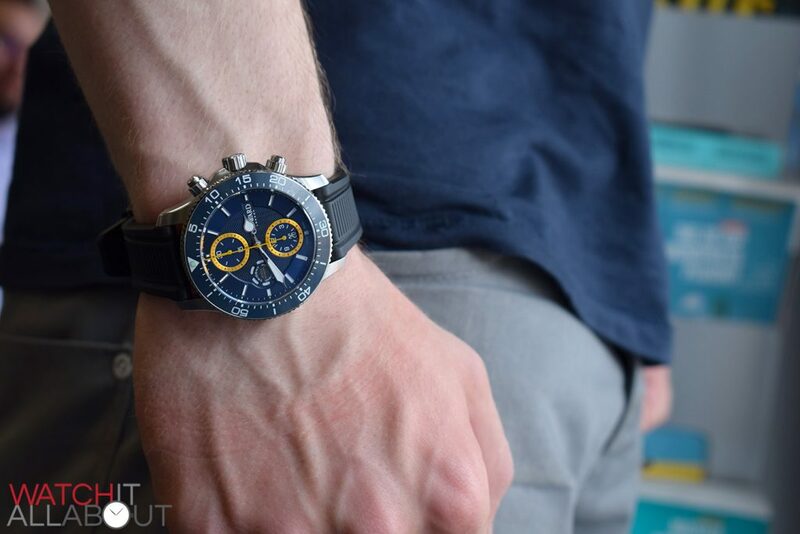 The chronograph seconds hand is yellow too; so when that starts going its easy to spot against the blue dial. The running seconds hand is a subtle yet unique affair, but more on that shortly. 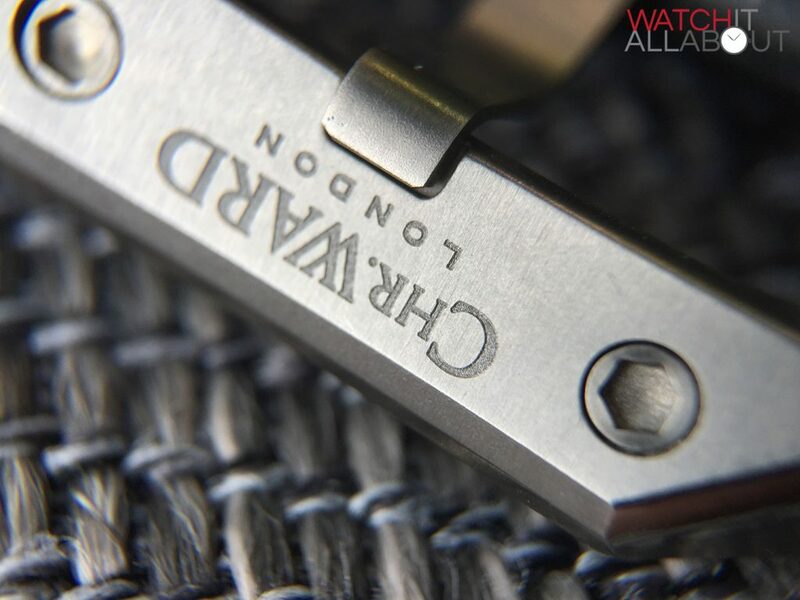 As is the custom with the C60 Tridents, we have a blue wave pattern reminiscent of the Omega Seamaster in the centre. This doesn’t engulf the entirety of the dial though, and around the outer edge we have a higher ring with a very light sunburst effect to it. These two work well together in the light to create a gentle dazzling view. At 9, we have the regulator inspired “breathing” running seconds hand indicator. The underlaying layer is lumed, so you can see it rotating in the dark. 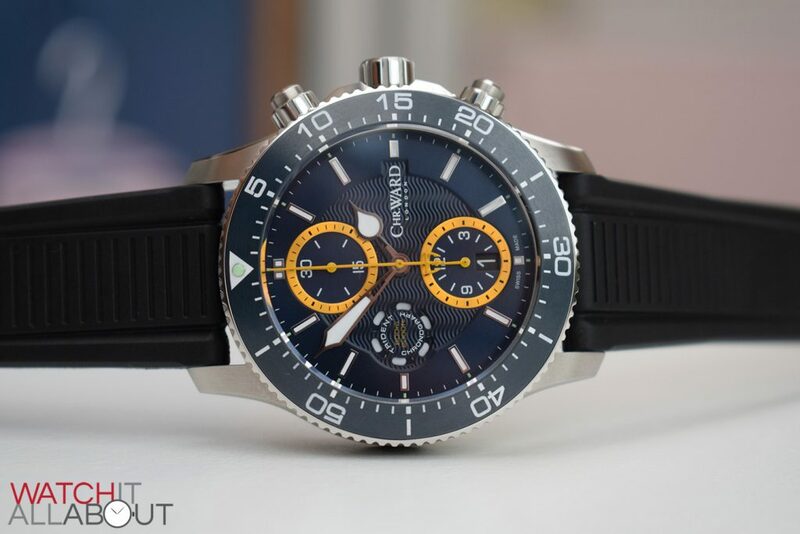 Whilst it’s a lovely unique design, if you’re an absolute sucker for setting your watches to the second – this is not for you. As there’s no mark for where the “seconds” hand is technically pointing, you are unable to set it bang on. The cut outs are all neat and tidy, with a delicate border around them displaying close attention to detail. 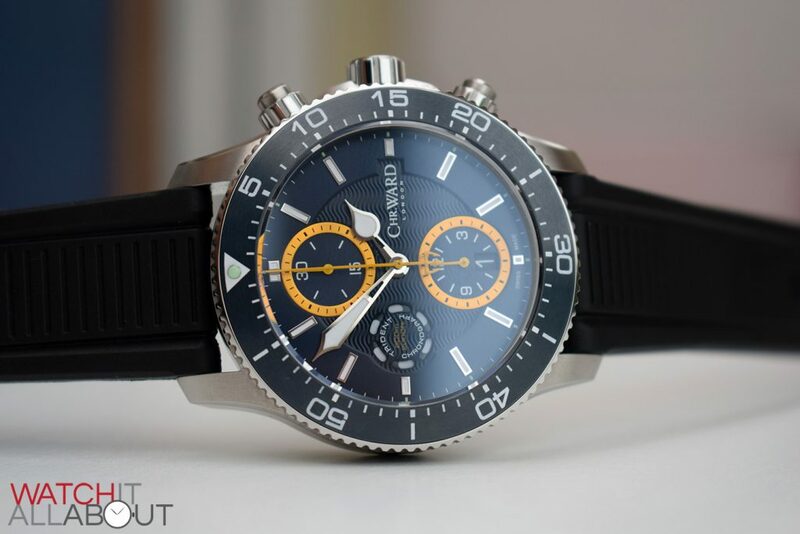 The chronograph minutes subdial is at 12, and the chronograph hours subdial is at 6. They both have a bold yellow hand and a matching yellow metal border to ensure excellent visibility. We have the traditional Trident style sword shaped minute hand and onion hour hand. Some aren’t too keen, but I really like them and believe that they’re a distinctive aspect of this range. 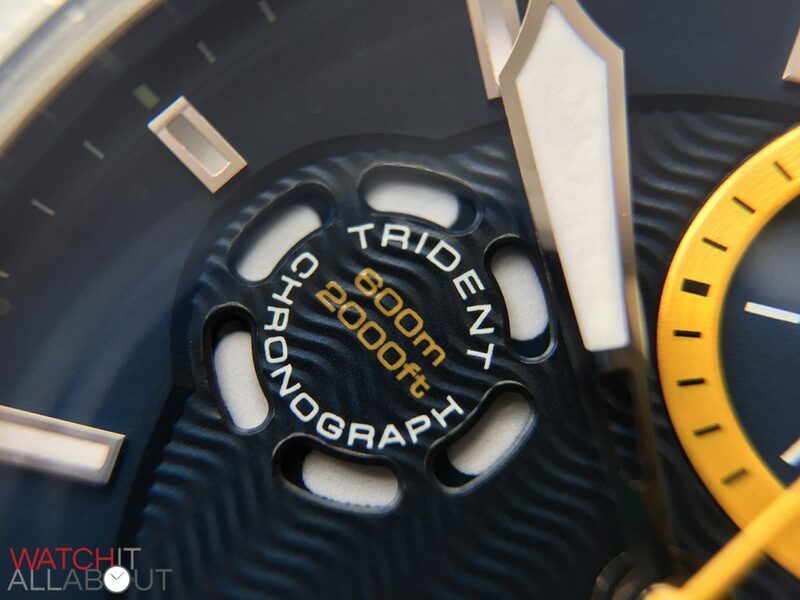 Along with these, we have the Trident counterbalance on the chronograph big second hand, which is also yellow. 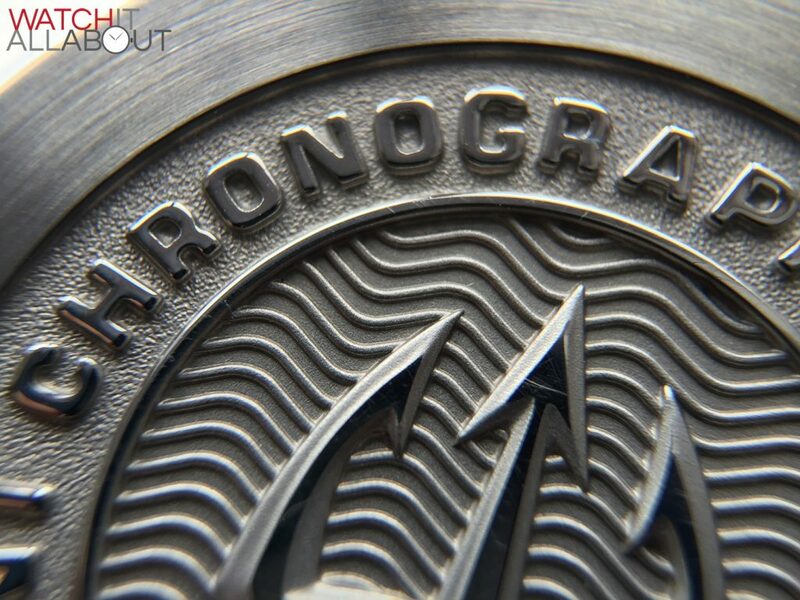 The hour markers are applied batons, with a polished border and lume filled centre. They are shorter at 12 and 6 (cut down by the subdials) to make them more of a square shape. As is usually the case with the Trident range, these applied elements are all flawless. 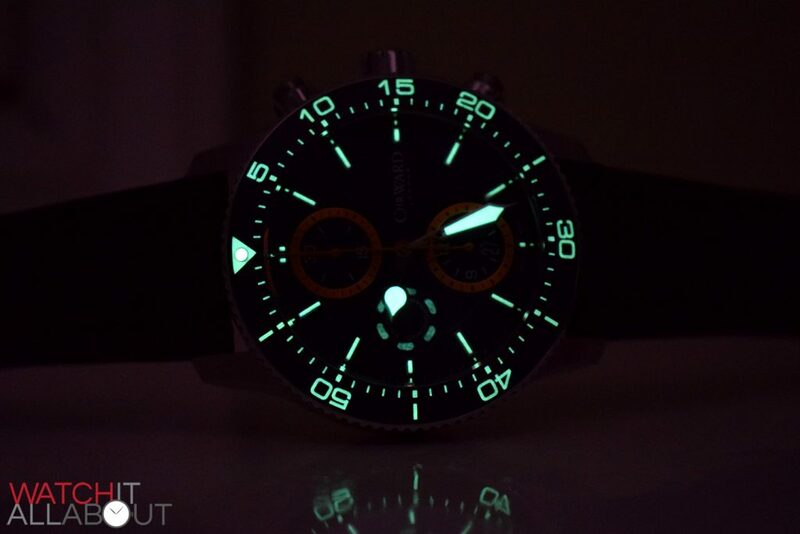 The lume used across the dial is SuperLuminova SLN-TC1, and is superb. CWs don’t usually have the best lume, so I’m really glad to see this upgraded. It’s super strong, quick charging and lasts a good while. 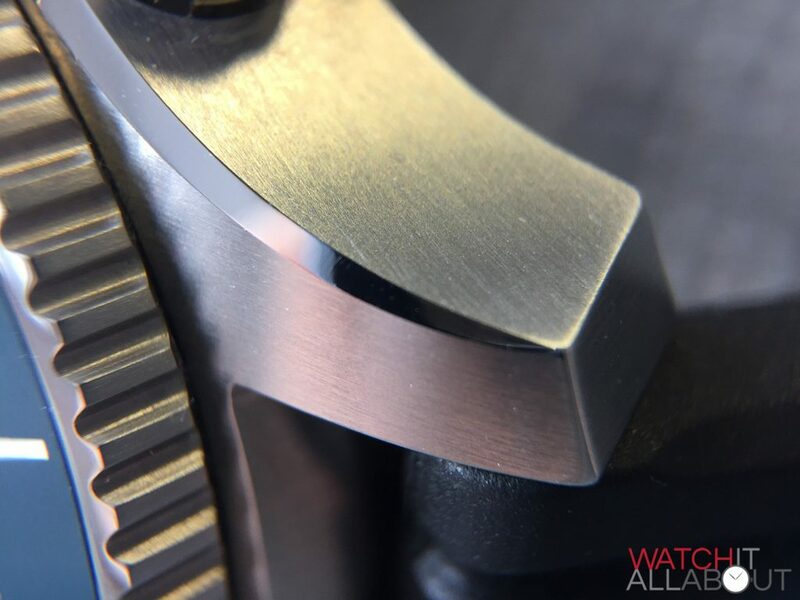 The date is concealed in bottom subdial at the base. The wheel is matched to the colour of the dial, so it’s very inconspicuous. I personally really like dates located at positions other than the traditional 3 o’clock. 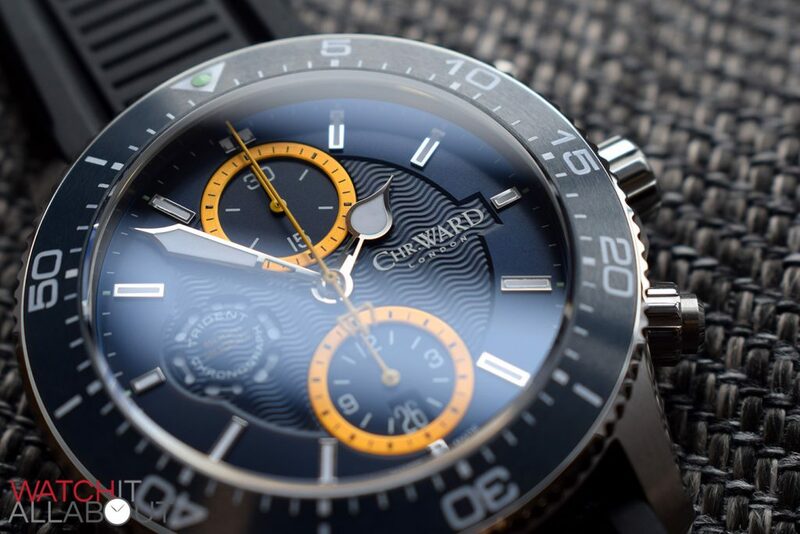 The dial is bold, yet easy to read; it’s also not too complicated. Everything is very well constructed and designed. 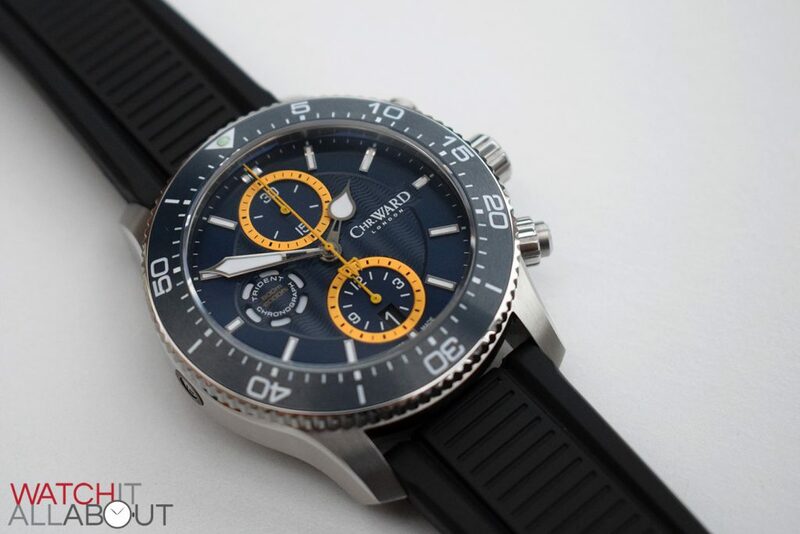 The movement powering the Christopher Ward C60 Trident Chronograph is the extremely popular ETA Valjoux 7750. 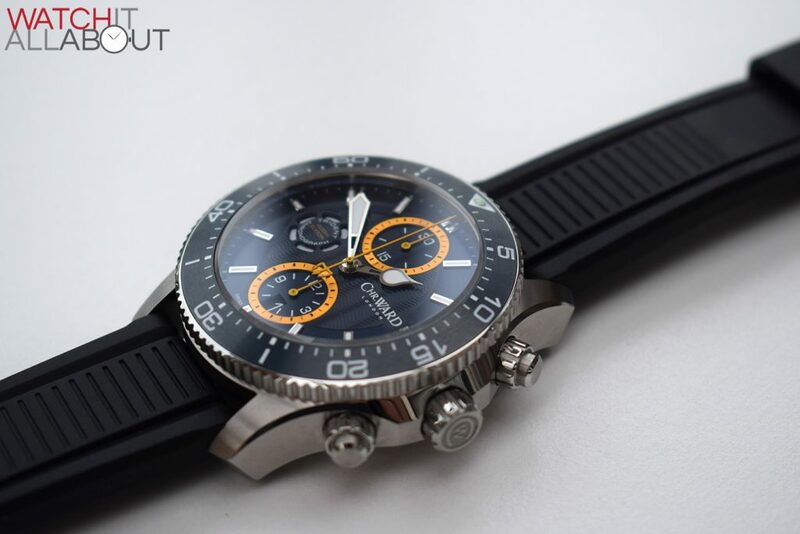 It’s the most successful automatic chronograph movements available, and is easy to adjust to ensure COSC accuracy. 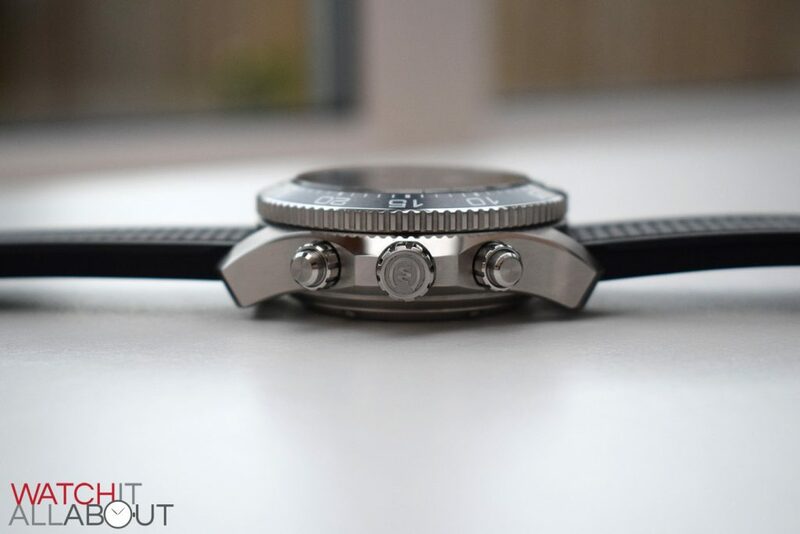 The movement in this Trident supports that – it’s so incredibly accurate (I’d say it’s nearly at COSC standards). 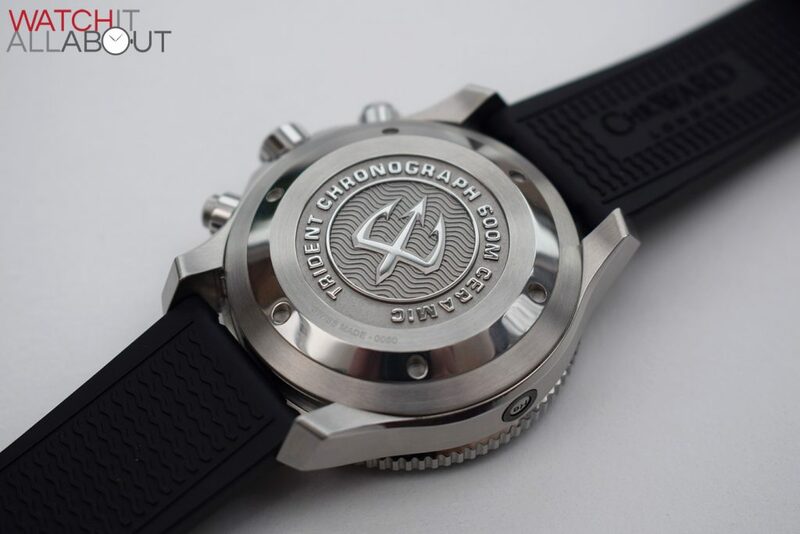 It’s found in a range of high end timepieces – such as IWC, Panerai, Oris, Tag Heuer, and Tudor just to name a few. It’s over 40 years old – and the fact that it’s still so widely used proves the marvel of engineering it is. 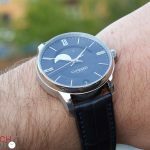 It’s relatively thick and large compared to its competitors, which also results in a larger and deeper watch case. This watch has provided me with my first experience of the “7750 wobble”. I initially assumed this referred to the second hand wobbling, but it’s completely fine and smooth. After some research and wrist time I can confirm this phenomenon. The large and heavy rotor winds in one direction only, so it can reach high spinning speeds in the non-winding direction due to the lack of resistance. This “free-spinning” results in a gentle “wobble” on the wrist. Quite fascinating really – and with this comes with you being able to hear the rotor spinning audibly. 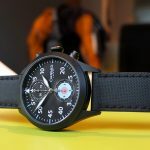 It is a charming and exceptional movement, but with the clampdown on the availability of ETA moments by the Swatch Group who knows how much longer it will be available for. 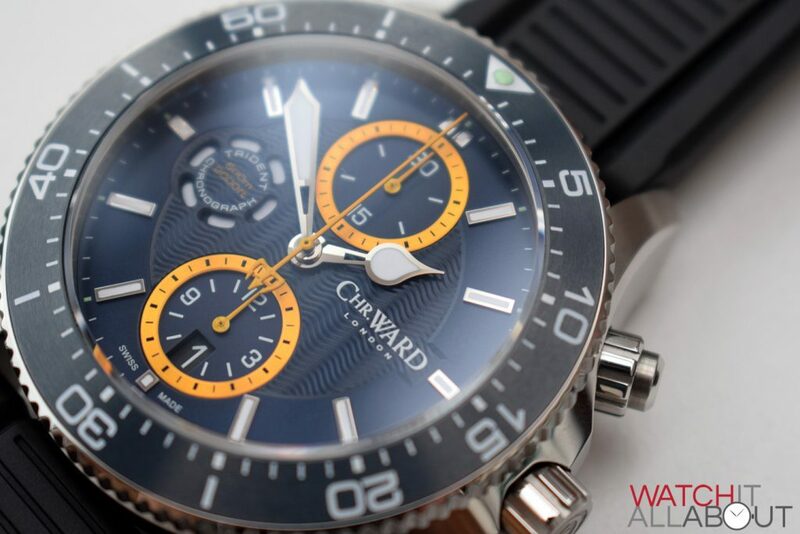 Thankfully, there’s a Selitta alternative available, and we know Christopher Ward are working on their own in-house chrono based on the SH21 – so who knows what the future brings. 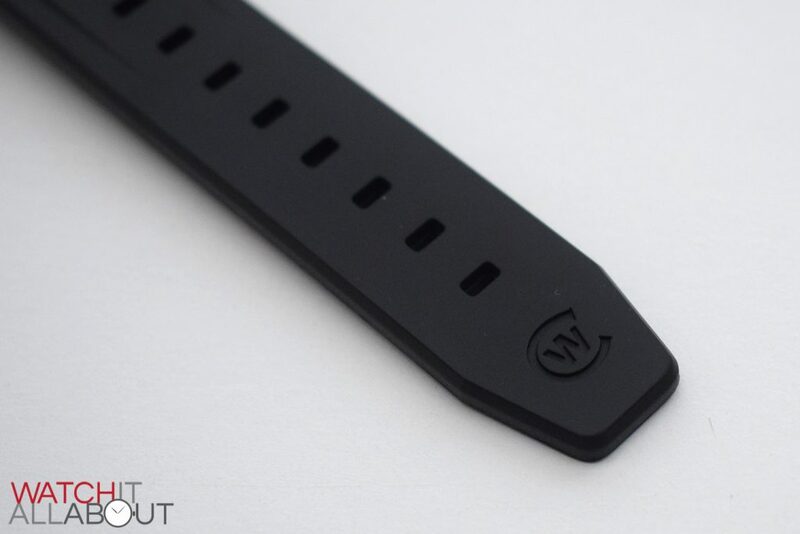 As I mentioned before, I would never usually choose the rubber strap for a watch. Bracelet first, then leather, then rubber. But here we are, and now I’m actually really happy that it’s come on it. It’s made the watch totally utilitarian; it’s made me more confident whilst wearing it: with leather I’d have to be careful getting it wet. With the bracelet I’d be scared of scratching it to death. Neither of those concerns exist with the rubber strap. And it’s not as if it doesn’t as good either; it’s surprisingly pleasing to the eye. It’s even recurves the prestigious “wife nod”. Surprising. 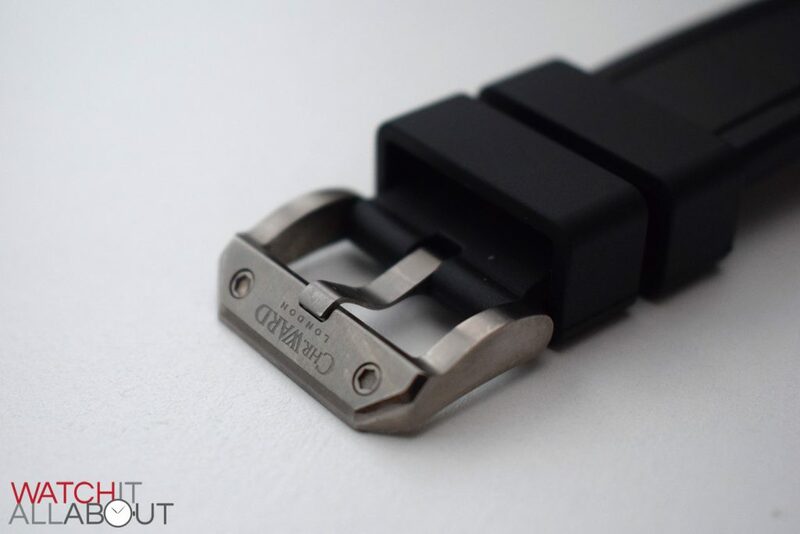 The strap measures 22mm wide at the lugs, reducing to 20mm at the buckle. It’s thick and sturdy, which is obviously good for those of us who would actually go diving. This thickness means it’s a little stiff at first but does loosen up eventually. 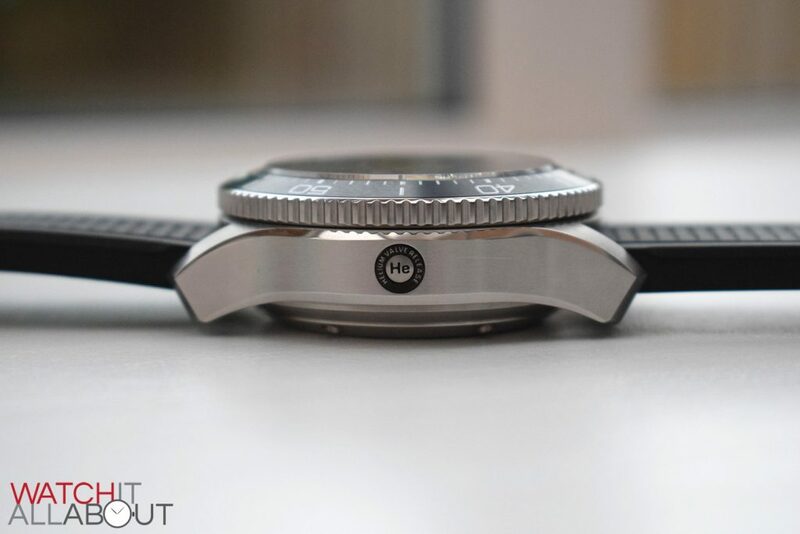 On the top, it has an interesting lined pattern, and on the underside is a wave pattern to match the dial. These are a couple of nice design touches so it’s not as plain as it could be, however the wave pattern can leave an imprint on the wrist. The tang buckle is very cool. It’s very angular / multi faceted with an array of polished and brushed aspectd just like the case. On the top is two hex screws which don’t do anything apart from look good, and the logo (soon to change) which is deeply engraved. The strap comes with two thick keeper loops weight are easy to use and don’t come loose at all. 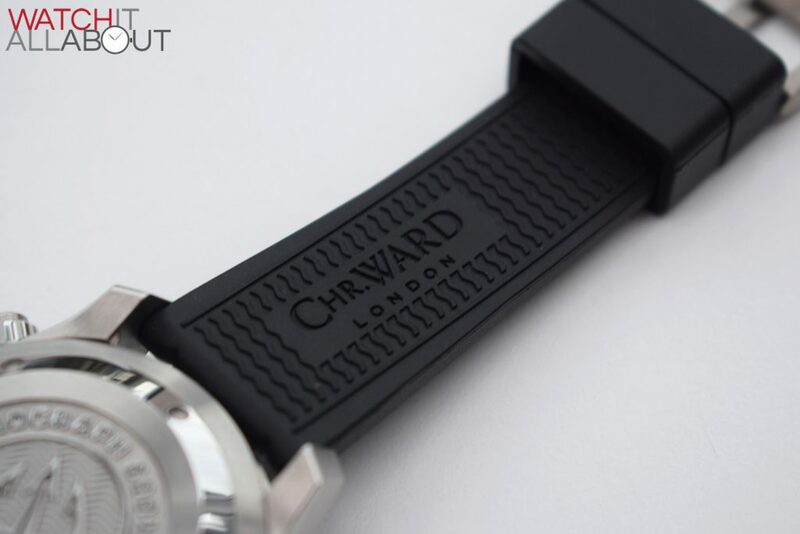 Finally, there’s the CW motif insert into the end of the long length of the strap (again soon to be changed). As I’ve mentioned before, this strap has been a bit of a revelation for me: it’s practical, comfortable and looks good to match. 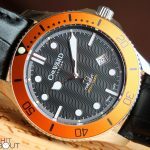 I’ve picked a couple of Swiss automatic chronographs to compare the Trident Chrono to. 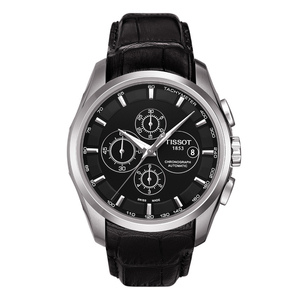 Firstly, let’s consider one of the cheapest Swiss automatic chronographs: the Tissot Couturier. This can be had for a mere £600, which is pretty incredible. 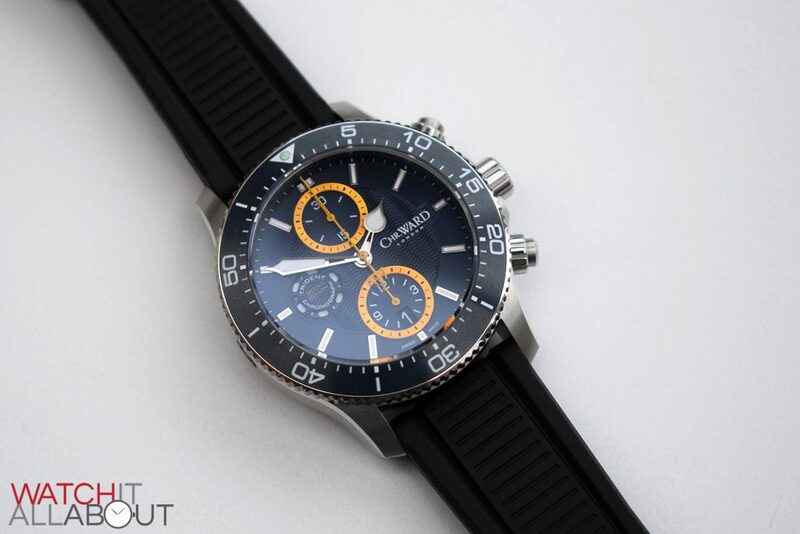 So if you’re just interested in a Swiss automatic chronograph, then this is a great option. 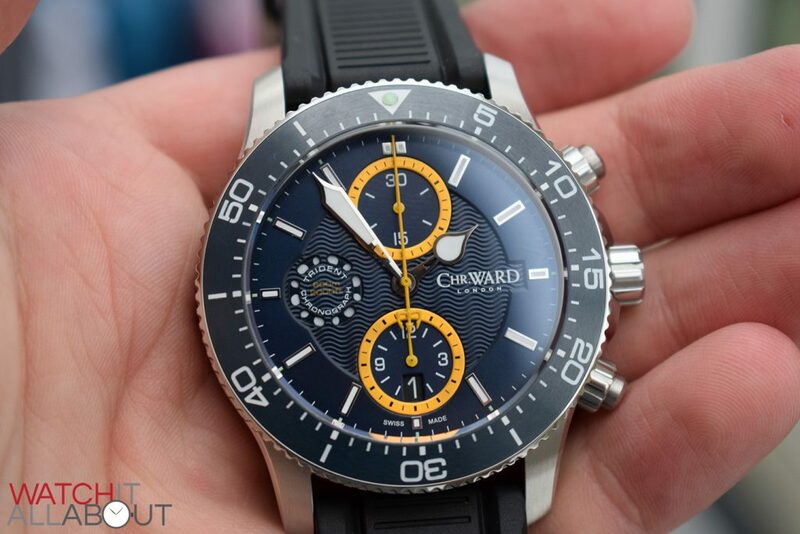 However, it’s nothing special at all in the looks department; nor is it in terms of specs when compared to the Christopher Ward. 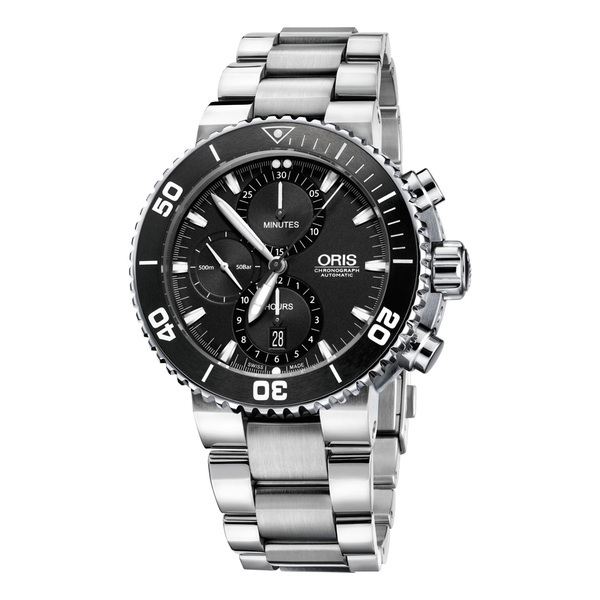 Alternatively you can go down the route of a watch similar in specs and appearance – let’s say the Oris Aquis. 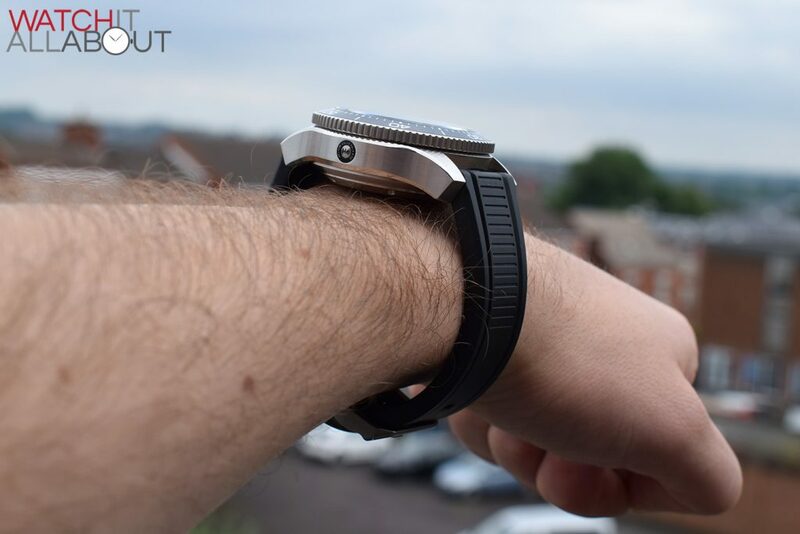 It’s got the same movement in, a ceramic bezel insert, and 500m water resistance. But, it’s about £2400 so there’s a pretty huge price difference. 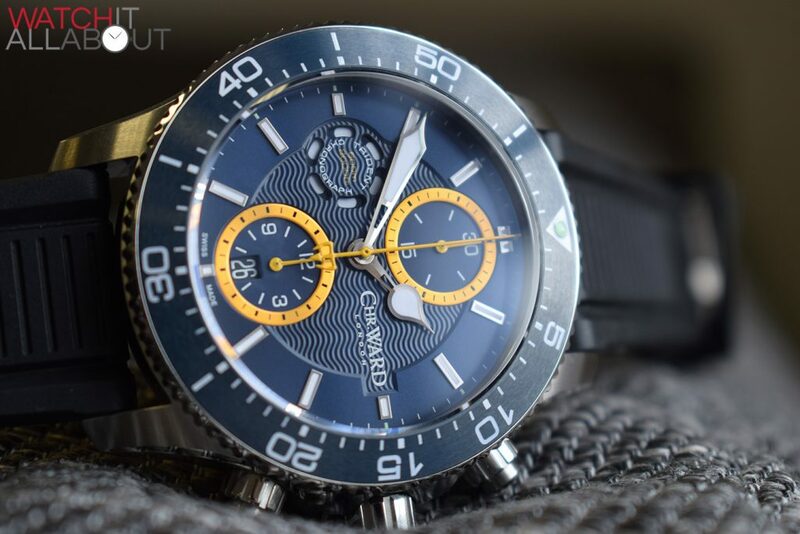 For the specifications, there is no doubt that the Christopher Ward C60 Trident Chronograph is excellent value for money. 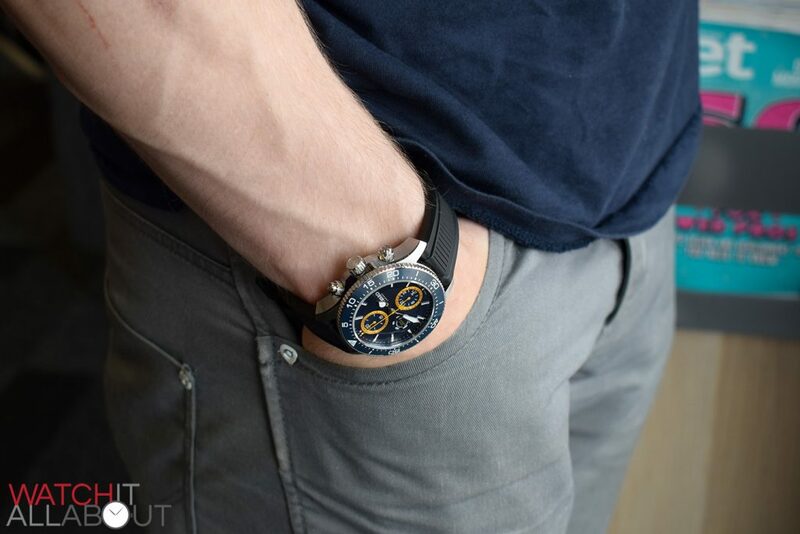 I’d love to see another Swiss automatic chronograph, with ceramic bezel insert and 600m water resistance for less. So already it’s a great buy. No only that though, it’s a real charmer in the looks department too. I was quite surprised when my wife said she likes it – she’s usually against large, modern watches. 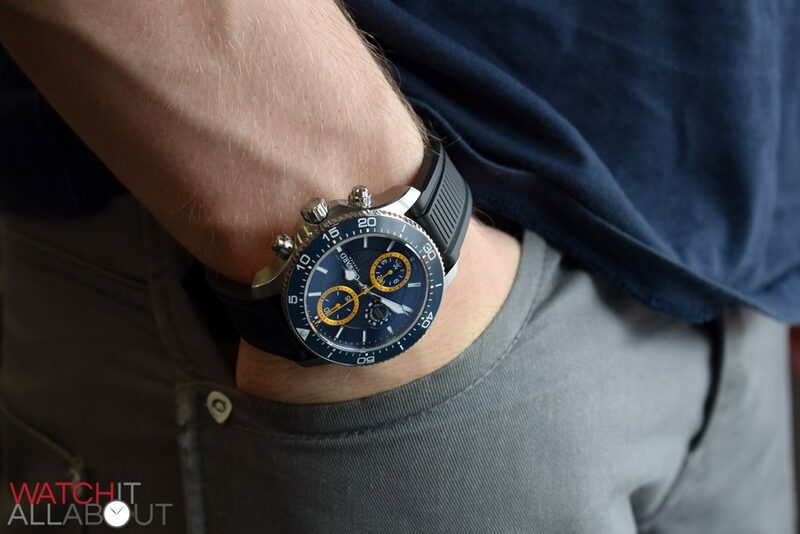 Every single person who has seen the Trident Chrono has loved it; and I’m not surprised either. It has a striking case build; sharp and meaningful, practical and over-engineered – which I love. 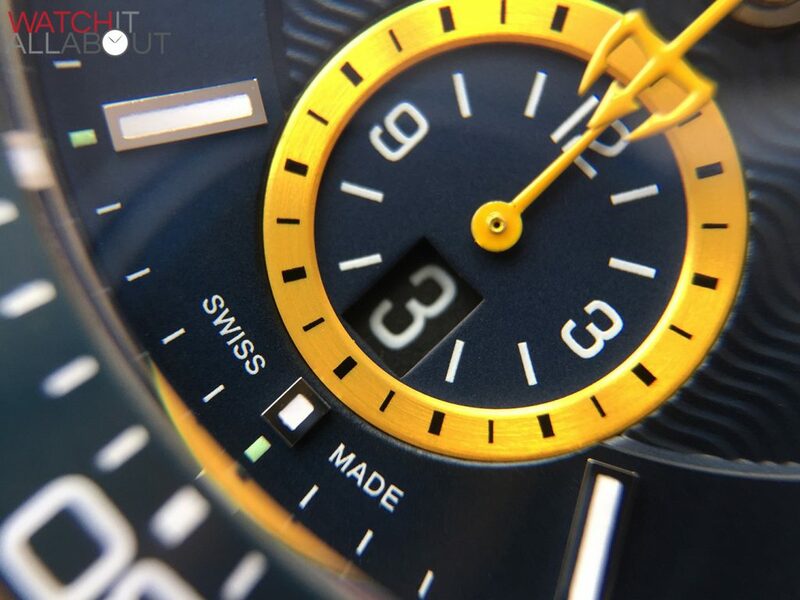 The dial is detailed yet bold, easy to read yet interesting. Multi-layered and full of texture, its finishing all over is top notch. 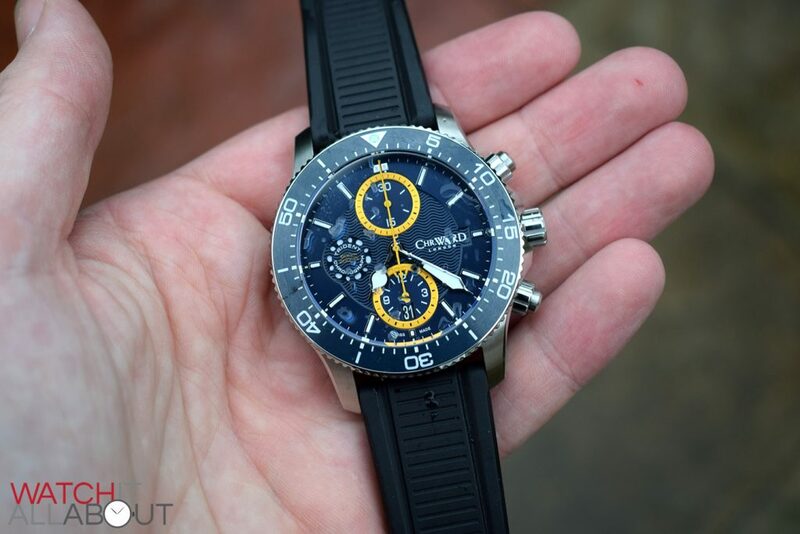 In my couple of weeks getting to know the Trident Chronograph, I’ve liked it more and more. I can’t take it off and I can’t stop looking at it. I think it might just be my new favourite CW. These CWL watches are basically me too watches that are way over priced. No service available unless you send it back to London and believe me you are going to need it! I owned one and had numerous problems with very little customer service. Save your time and money and get a more recognized brand, You will be glad you did. 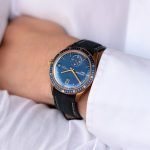 I own several CWL watches as well as a couple of Omegas and a Tudor and a clutch of vintage watches – I’ve never had any issues whatsoever with the CWL watches – your opinion is yours and you were obviously unfortunate. 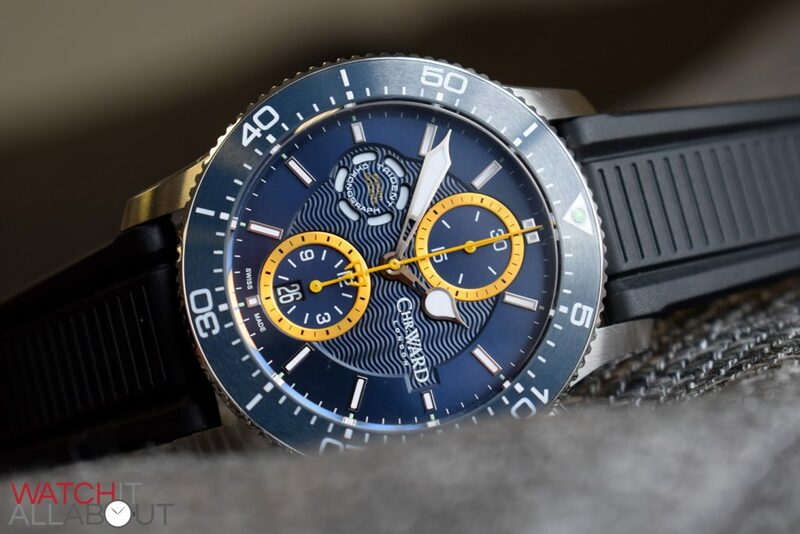 I wear a C60 Trident Pro as a daily, it gets very hard use and hasn’t missed a beat yet. 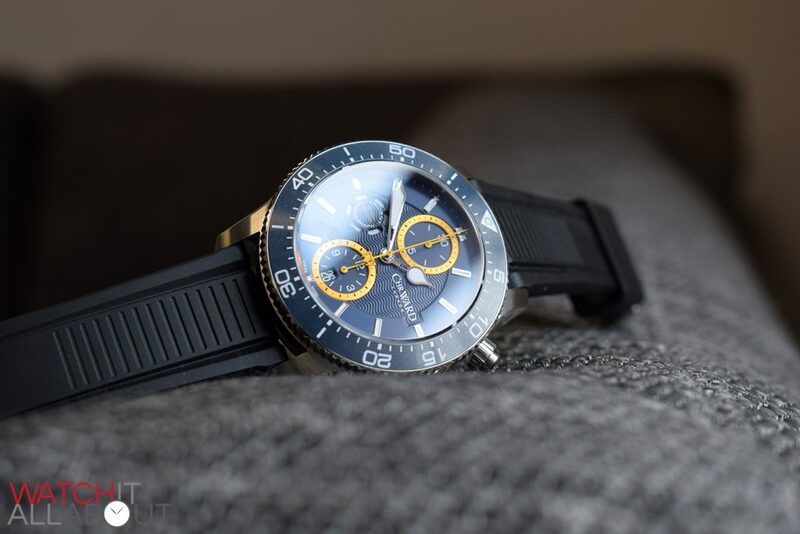 ‘me too watches that are over priced’ – pish & wind! I’ve also had two CWL watches – a C60 Trident COSC 600 and a C9 Harrison 5-Day Automatic – and I couldn’t be happier! Both lovely watches that get regular wrist time in my rotation.